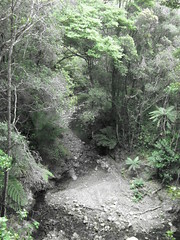 Today’s walk was around the Rimutakas, once again centred on Catchpool Valley. People: Annemarie, Stijn, David, Andrew, and me. This is a fairly standard circuit from the Catchpool Valley road-end. It’s a matter of walking along the Orongorongo Track, almost to the Orongorongo River, but then turning off to the left up the McKerrow Track. The intersection with the Clay Ridge track is a couple of minutes before the peak of Mount McKerrow, and from there it’s a walk down the Clay Ridge track back to the parking area. We began at about 9am, after an 8am meeting at Wellington Railway Station. The weather was really good, and I calibrated my altimeter toy to 50 metres. (The exact altitude is unclear from the topo map, except that it’s somewhere between about 40 and 60 metres.) There were several groups out this weekend, many of whom looked as if they were from tramping clubs. One van pulled up at about the same time as ourselves, and they were doing what looked to be the same trip in reverse. I’m guessing they were from the Tararuas’ club for reasons which I won’t go into. There was about an hour of easy walking along the almost flat Orongorongo Track, before we reached the pole that marked the McKerrow Track turn-off. At this point we stopped briefly for some snacks, and began the climb. 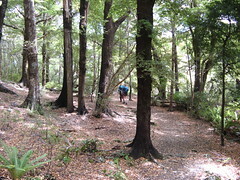 It’s a fairly straightforward climb up the McKerrow Track through the trees. I think the last time I walked on it was during a trip in March, when a group of us bashed our way up a spur from Turere Stream, and ended somewhere near the top. At that time we thought we were going to get to the top of McKerrow, but we’d mis-judged the place where we’d hit the McKerrow Track, and turned the wrong way. On this trip however, we did reach the top of McKerrow, so I can finally say I’ve been there. We met a few people along the way before we reached the top. The first was a nice chap from the Hutt Valley Tramping Club. He was out to walk a trip that he was planning to lead for his club in a couple of weeks time, which sounded interesting as a daywalk for some other day. He’d begun his walk from a street in Wainuiomata (I forget the name), and walked up the McKerrow Track from the other side. He’d now been over the top, and intended to walk along the Turere Ridge to the Whakanui Track, and then head back north to Wainui where he’d started from. The second group of people we met were almost at the summit, and it was the same group we’d seen at the carpark. They had left slightly after us, but had already reached McKerrow’s summit by coming up Clay Ridge, and were now on their way down. There wasn’t much of a rush, and Stijn was capitalising on the opportunity to take some photos, after he was reminded about the upcoming club photo competition, and had resolved to win it. We reached the summit of McKerrow at about 11.45am, and sat down for some lunch. Well, everyone else did. I’d been a bit lazy in expending effort towards preparing lunch, so I tucked into the Meal Mates I’d thrown in at the last minute. This was the first time I’d been to McKerrow, and I was quite surprised that it’s almost not marked at all. Rather than having a clearly obvious pole in the ground, as DOC uses on popular tracks in many other parts of the Rimutakas, McKerrow is marked by some kind of drainpipe sticking out of the ground by about 30 centimetres. There’s also a destroyed sign lying there, which looks as if it’s been there for a while. Interestingly my altimeter toy was displaying an altitude of about 580 metres, which was about 130 metres lower than it should have been at that point, and in the space of about 3 hours. I still haven’t figured out how well it’s working, but there might also have been a significant improvement in the weather during that time, which would be consistent with the Sun having come out much more obviously. After about 25 minutes for lunch, we followed the track back the way we’d come for a few minutes, and at the intersection we turned right and began to follow the Clay Ridge Track. Some guy was just getting started jogging down the track as we reached it, and he probably got well ahead of us. From then on, we didn’t see anyone else until we’d returned to the parking area. The Clay Ridge Track traverses several small out-croppings outside the bush line, which gave us the opportunity to see the surrounding ridges a few times, as well as the sprawling metropolis of Wainuiomata, for that matter. We continued down the track for the next couple of hours, which although beginning reasonably steep, eventually levelled out into a gentle slope under the trees. This resulted in a fairly easy stroll. We were back at the car by 2.30pm, and finished off the afternoon by stopping for some ice cream at Petone. I had a hokey pokey sundae. The end. 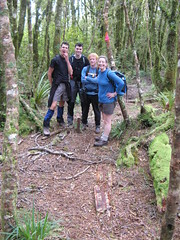 This entry was posted in daywalk and tagged altimeter, daywalk, rimutakas, wellington tramping and mountaineering club. Bookmark the permalink.